Bake cake mix as directed and pour into three 8-inch pie tins. If you only have one pie pan, bake each for about 12-15 minutes or until done. Prepare pudding as directed, and set aside. Cut uniform slices of strawberries and kiwi and set aside. Reserve 1 cup each of strawberries and kiwi to be chopped up for filling (I use the smaller slices and ends). Mix together chopped strawberries, kiwi and 2 tablespoons of sugar. Set aside. Place the first cake disc in a trifle or clear glass bowl. Around the edge of the trifle bowl, alternate slices of kiwi and strawberries, laying fruit flat against the outer edge of the bowl. With a spoon, spread one half of the chopped strawberry/kiwi pieces over cake layer. Drop spoonfuls of one third of the pudding over strawberry/kiwi mixture. Add second cake layer. Line the edge of the bowl with fresh blackberries or blueberries. 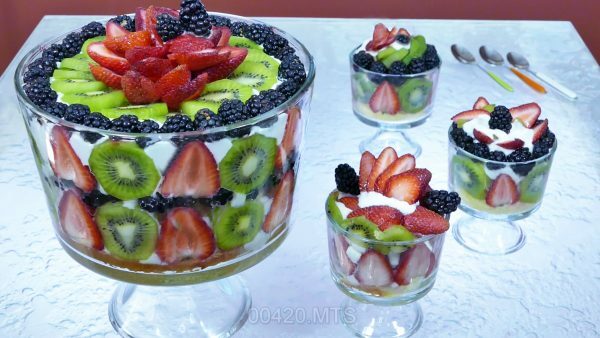 Add second layer of strawberry and kiwi slices on top of the berries. Spoon remainder of the strawberry/kiwi mixture over cake. Add ⅓ of the pudding over top. Add third cake layer. Place strawberries and kiwi around the edge of the bowl. Spoon the remainder of the pudding over cake disc. Combine whipped cream and powdered sugar, beating until stiff. Spread whipped cream over pudding and decorate with remainder of fruit slices. For the final touch, if desired, spoon some whipped cream into a piping bag and create a mound in the middle of the cake and top with a fresh strawberry. Refrigerate for at least one hour or overnight. Spoon into clear dessert bowls or parfait glasses.